Many people come to Alaska to have adventures, witness the wildlife, and, where possible, touch the hand of God. It is an amazing and awe inspiring place full of history, culture, scenic wonders and an almost boundless wilderness...It is also the place we call home. Juneau sits deep in the Tongass National Forest trapped between the steep coastal mountains and the ocean of Alaska's Inland Passage. There are some real advantages to seeing Juneau with a taxi tour! Where others charge per person rates, your cab is hired by the hour and seats up to 7 people. 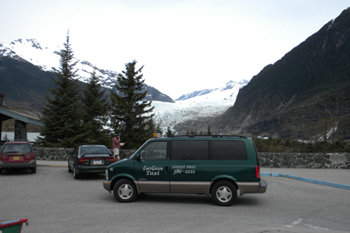 This makes the taxi tour one of Juneau's most affordable options. Secondly, as mentioned above, we live here. Juneau is the place we call home and who else would be a better guide than a local? Plus, when you spend your money with us, it stays in the economy and genuinely benefits the whole community. Finally, the taxi tour is not at all weather dependant. No matter what is going on outside of the vehicle, you are safe from the elements in your climate controlled environment. EVERGREEN TAXI offers extremely personalized tours that allow our guests to create their own experiences as they go. We are not a "hard sell" agency. We recognize that it is your time, dime, and vacation. How you spend it is entirely up to you. We look forward to serving you in any way that we can while you are in Juneau, and sincerely hope you the best of all vacations! If you are ready to make a reservation for a tour, click here. For tours and or large groups advanced booking, you may also call 907-723-4550. The City: This zone is bordered on the south by Thane Road, to the West by Douglas Island, and to the north by Salmon Creek. City properties include The Westmark Baranof Hotel, Alaska's Capital Inn, Prospector Hotel, Silverbow Inn and Bakery, the Youth Hostel, Driftwood, and the Breakwater. The Valley: The greater Mendenhall Glacier Valley is Juneau's most populated residential area. The airport, along with several hotels are located just outside of the valley. Some airport area properties are the Extended Stay, Travel Lodge, Super 8, Best Western, Grandmas Feather Bed. Auke Bay: North of the Valley. This is the area accessing our Alaska Marine Highway, Statter Harbor, Allen Marine, Deharts, and Fisherman's Bend. West Juneau, Douglas, and North Douglas: It's all on the other side of the bridge from downtown Juneau. Thane: A quaint residential area south of town.